The Redskins are a rare team that is as banged-up as the Eagles. As usual, the Philadelphia Eagles will head into Monday night with a laundry list of injured players. In this matchup, however, the Washington Redskins are arguably every bit as banged-up. • CB Jalen Mills (foot): Mills was toasted quite a bit during the early part of the season, but he was playing better when he went down with a foot injury. After seeing some of his replacements in action over the last few games, it is clear why Schwartz prefers Mills over the rest of the bunch. 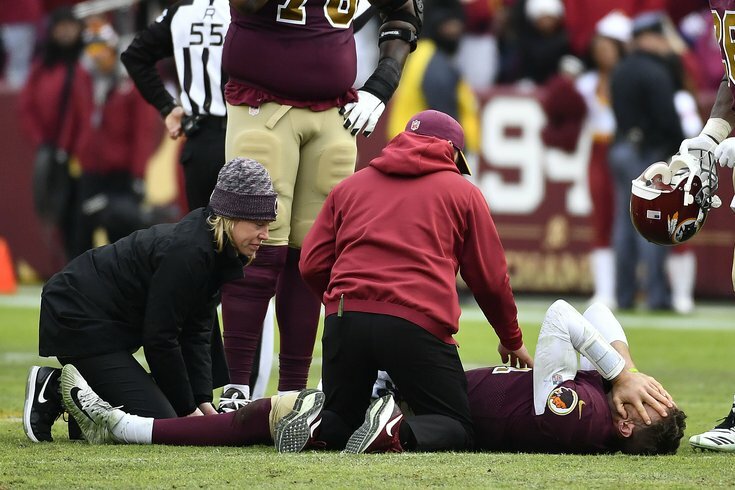 • CB Avonte Maddox (knee, ankle): Maddox's injury looked more serious when it occurred than it actually is, but he'll still likely miss some time. • LB Jordan Hicks (calf): This is perhaps a weird take, but Hicks' absence might not be the worst thing for the Eagles, as they'll get a chance to see how Kamu Grugier-Hill and Nate Gerry look with more snaps and more responsibilities. Hicks is a free agent this offseason, and the Eagles will have to make a decision on how important he is to the team, and how much they're willing to spend to keep him. How Nigel Bradham, Grugier-Hill, and Gerry play with Hicks away could be part of that puzzle. • RB Darren Sproles (hamstring): Sproles may finally be ready to go after missing 11 games. The last time he saw the field was Week 1 against the Atlanta Falcons. • DE Michael Bennett (foot): Bennett has been the Eagles' most productive edge rusher this season, as he has collected 6.5 sacks and a forced fumble. Bennett played through pain last Sunday against the Giants, and it is expectaed that he'll do the same this Monday night against Washington. • Josh Adams (hip): The Birds' new lead back is a surprise addition to the injury list. • WR Mike Wallace (IR): Wallace, formerly the Eagles' No. 2 receiver, broke his fibula against the Buccaneers. Doug Pederson noted that Wallace is doing well, but he is not yet ready to return..
• LB Zach Brown (knee): Brown is second on the Redskins with 69 tackles, which is nice. • WR Jamison Crowder (ankle): Crowder is the Redskins' slot receiver. He has only been able to play in four games this season. 13 catches for 134 yards, 1 TD. • CB Quinton Dunbar (shin): Dunbar got roasted all over the field by the Cowboys on Thanksgiving, as he didn't look anything close to 100 percent. • DL Matt Ioannidis (shin): The Temple product has become a good rotational player along the Redskins' D-Line. • RT Morgan Moses (knee): Moses is the starting RT. With Trent Williams hampered by an assortment of nagging injuries and the Skins missing both of their starting guards, Washington desperately needs Moses to play. • WR Trey Quinn (ankle): If you saw the Redskins' loss to Dallas on Thanksgiving, you saw Quinn making plays both as a slot receiver and a returner. • TE Jordan Reed (back): The Redskins' leading receiver used to kill the Eagles, but he has been neutralized in recent years by Malcolm Jenkins. • QB Alex Smith (IR): Heading into the game in which he was injured, Smith had led the Redskins to a 6-3 record, throwing for 10 TDs and 3 INTs, with a quarterback rating of 90.7. The Redskins' backup quarterback is Colt McCoy, an eight year veteran with a career starting record of 7-18. McCoy is almost like a less-talented version of Smith. The Redskins didn't carry a third quarterback at the time of Smith's injury, but they have since signed Mark Sanchez. • RG Brandon Scherff (IR): Scherff made each of the last two Pro Bowl rosters, but was lost for the season after injuring a pectoral muscle. He was replaced in the lineup by Tony Bergstrom. • LG Shawn Lauvao (IR): In the same game the Redskins lost Scherff, they also lost :Lauvao for the season with a torn ACL. Lauvao was replaced by Jonathan Cooper. • WR Paul Richardson (IR): At the time he was lost for the season, Richardson was the Redskins' leading wide receiver, statistically. He was the deep threat in the Redskins' offense. • RB Derrius Guice (IR): Leading up to the 2018 NFL Draft, Guice was a player commonly mocked to the Philadelphia Eagles, who were thought to be in the market for a running back. Instead, Guice was passed over by the Eagles and the rest of the league, likely due to what was considered to be at the time, “personality concerns.” He ended up being selected in the second round, 59th overall, by Washington. After an encouraging offseason, Guice was lost for the season with a torn ACL, and the Redskins signed Adrian Peterson to replace him. • OT Geron Christian (IR): Christian was the Redskins' third-round pick in 2018. He played at LT in relief of Williams at times this season. Should Williams go down against the Eagles, Ty Nsekhe would fill in. • LB Reuben Foster (Commissioner's exempt list): Foster was released by the San Francisco 49ers on Sunday after being arrested on charges of domestic violence late Saturday night at the Niners' team hotel in Tampa. It was his third arrest in 2018, and second accusation of domestic violence in the last year. The Redskins scooped Foster up off of waivers without even contacting the police for more information of his arrest. Instead, they claimed to have spoken with former teammates of Foster's at Alabama who are presently on the Redskins' roster, of which there are five. It was later uncovered by the Washington D.C. media that the Redskins only spoke with two of Foster's former Bama teammates. What a joke of a franchise.